In the last decade, workplaces have started to evolve towards digitisation. A better management of the information overload could expand our level of understanding and increase the ease with which we learn, memorise and take decisions. The workplace of the future has become a key focus area for businesses looking to improve work productivity, collaboration and data management. At Konica Minolta, we see it as a network of people, sensors and devices that, when combined, create a digital cortex by understanding the world around it. The emergence of AI, combined with deep learning technologies and new business models, is enabling organisations to manage information flows in these digital workplaces. 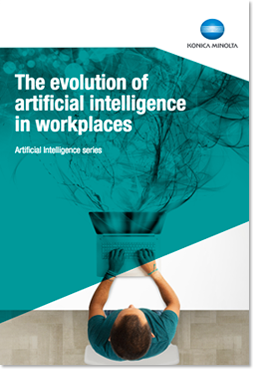 The seminal white paper looks at how AI technology is improving work productivity and collaboration by allowing users to focus on their goals instead of the means to achieve them. A brief history of AI and what it means today ― The beginings and how smart integration is evolving software-based AI to neuromorphic computing. How Konica Minolta is building an innovative cognitive hub, a new cyber-physical platform that benefits users and businesses.